I consider myself truly blessed to have grown up in a family who valued the great outdoors. As a child, I was exposed to the peaceful, sprawling prairies of Manitoba, Canada; the majestic mountains of British Columbia, Canada; and the historic New England Coastline. With parents and grandparents who took me camping, hiking and exploring, I was able to develop a deep love and appreciation for the environment. One of the things that had the biggest impact on my falling deeply and madly in love with St Croix was the pristine marine park at Buck Island Reef National Monument. In my first year living on St Croix, I spent considerable time out there working with Big Beards Adventure Tours on the weekends – and when I wasn’t working, I was jumping aboard for the day to snorkel and explore the East End. I love that local families have this incredible resource in their back yard. I love that exposure to this environment can instill the same values of cherishing and protecting the natural world around us in the people that visit Buck Island: once in a lifetime, on a yearly vacation or every weekend with family and friends. But the kind of experience visitors to Buck Island have enjoyed since the park was established in 1961 is being threatened. The National Park System is preparing to implement a new 20-year park management plan. Currently, there are four options being considered… well, kind of. Plan A (Our Buck Island‘s preferred plan) is “No Change”. As we understand it, this plan has to be included by law, but isn’t even being considered by the park. Plan B, NPS’s preferred plan, and the one that we understand they will be implementing calls for banning all anchoring at Buck Island and constraining boaters (even on the West End) to a limited amount of installed moorings. It also calls for creation of a 5,000 acre restricted zone on the North side of the island. We are avid environmentalists who want to continue to enjoy Buck Island while protecting the environment. The current proposed “Plan B” which is the plan that has been publicly stated by Park Superintendent Joel Tutein as the Park Services preferred plan, proposes a prohibition on all anchoring in sand and forcing boats even on the West Beach to be limited to a restricted number of moorings. What this means is that boats will be forced to drop passengers off on the beach and then go out to moorings that are set at a certain distance. Effectively leaving their passengers behind. NPS's Proposed "Red Zone" All areas in red are restricted to swimming only. 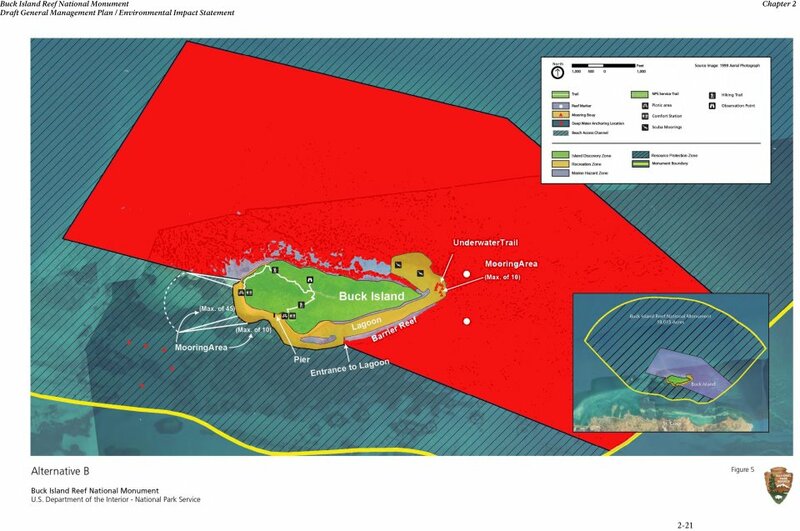 The second objectionable portion of Plan B is the proposed 5,000 acre Marine Park Area on the Northside of the island or “Red Zone” in the image which will restrict all activity in that area to swimming only. Yep, you read that right, ONLY SWIMMING. Prohibited activities will include snorkeling, kayaking, paddle boarding, kite surfing, wind surfing and any other green activity besides swimming. This is some of the most pristine snorkeling and diving area on the island that receives little activity to begin with. But ALL activity will be restricted. The purpose is to protect endangered Elkhorn corals. However, the expansiveness of the 5,000 acres includes a large area of corals that are in waters 100 feet deep. How would this be harmed by paddleboard or snorkelers on the surface? I found it interesting that last week when Superintendent Tutein and another NPS employee were on the radio and it was brought up by a caller that its SAFER to snorkel in that area with a mask on so that you can see the corals and avoid them – they stumbled a bit on their words. We aren’t asking to drill oil or run jet skis or power boats even. We are asking to retain the right to explore in a mindful, environmentally sound way. We are asking to preserve the rights of the children of the island and residents of the entire nation and the world to have the right to view this magical underwater world. Its important to note that this isn’t a local issue, this is a national issue because it’s a National Park. YOUR National Park. The park is attempting to limit YOUR usage and ours with no firm reason or study that shows that by implementing these changes they will be protecting something that is currently being harmed by our activities. If that were so, we would be behind them. By retaining the rights to enjoy this area of the marine park in a low impact way, we retain the ability to teach others about the beauty that is there under the surface. We can help others understand why it is so important to conserve and protect our oceans and the animals that live in it. By sharing the beauty and wonderment of this underwater world, we can share our love of OUR Buck Island. We want to protect the environment, but we also want to enjoy it in a safe and protected way. That’s all we are asking. Download the NPS Public Notice which includes recent frequently asked questions, Public Meeting times & Directions to the meeting location. Note: On the page, there are download of each section of the plan if you would like to review the information before commenting. Download, circulate and sign the petition to vote for Plan A. You don’t have to live on St Croix! If you’ve been to Buck Island or ever plan to go, show your love. Attend the Public Hearings! Its crucial that we are there in numbers. Unfortunately, these meetings have been scheduled during Spring Break week when many in the boating community are already scheduled to be away. So, if you are here on St Croix, please be sure to come out. National Park representatives from Washington DC will be there. Where: Slave Market (Old Post Office) on Company Street across from the Steeple Building. Free parking will be available in the Fort Christianvaern parking lot for the meeting. We understand that there is only 30 minutes allotted for public comment. So bring a sign to hold up that says “Plan A”! I went to the meeting last night . I wasn’t angry about the proposed changes until I heard what the NPS had to say. I can’t believe how severe the proposed restrictions are. No snorkeling in the “Marine Hazard Zone” ? Are you kidding! It’s the only safe way to negotiate the coral and not damage it. Moorings in on the west end? Who is going to maintain them? Who pays for the damage when the boats break loose from failed moorings? How are little kids, the elderly and the disabled supposed to get ashore? The boats anchor in deep sand and don’t cause damage. Leave us alone! I wrote to Donna Christiansen this morning. Also the NPS and my representative in Michigan who sits on the NPS committee. We need action! Anyone who didn’t attended the public meeting last night should go tonight. The NPS needs to hear the people who use the island. It’s clear the consultant has no idea about boating issues. The National park system is destroying the natural landscapes with parking lots near beaches that don’t require them. People and tourist alike have been parking for 50 years along side the road and in openings in the shrubbery without causing any damage to the shorelines. A perfect example is Maho Bay in St John where they filled in the wetlands to put a parking lot which now bring 100’s of tourist and over crowds the small beach. The US National Park Service now has Park rangers roaming the beaches with side arms , Hand cuffs Etc. looking like the Gestapo and just ruining the aura of the place. What used to be a good thing is now being ruined by rules and regulations where they’re not needed. If Rockerfeller saw today what is hapening to the land he donated in St John he would have you in court. Rockerfeller made a stipulation that the land he donated was for the people to enjoy and that there should not be any fee whatsoever for the use of the park. Well the National Park system basically figured he’s dead now and can’t do a thing about it. The NPS charges and entry fee for some of the beaches and forces boaters to take a mooring and pay a daily rate. You the NPS claim the moorings are saving the seabeds from anchors. Well the reality is when people anchor they can only fit a small number of boats due to anchor swing. The moorings put down by the NPS that you are forced to use and pay for are not guaranteed if they break and you lose your boat. The mooring also have a chain screwed into the bottom whether on sand or through coral and these moorings swing around with the tides and destroy or the turtle grass around them for about a twenty foot diameter. 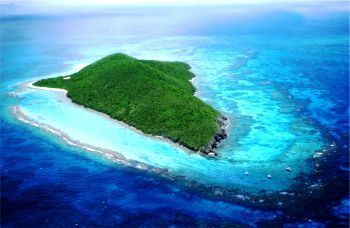 It seems like now your going to destroy by limiting people to St Croix’s Buck Island. And the ridiculous thing of eliminating snorkeling , Kayaking Etc. Whoever came up with this has to be mentally insane.